MPs on Westminster’s Scottish affairs committee heard the warning from Kristen Hopewell, a senior lecturer in international political economy on trade at Edinburgh University. Ms Hopewell said companies had already moved to the north-east from Norway in order to access the EU market and are likely to move again, even in the event of a soft Brexit. “Norway does not have the same kind of tariff-free access that Scotland and the UK has and that is part of the reason Norway moved a lot of its fish processing to Scotland,” she said. “If Scotland all of a sudden faces a very high tariff on its exports, that could have profoundly negative impacts on the Scottish fish processing industry. The academic added that a no deal Brexit, leaving on World Trade Organisation (WTO) rules, would effectively block access to the EU market due to extremely high tariffs. EU tariffs for seafood are already as high as 24% on some seafood products and would be “extremely high” under WTO rules, Ms Hopewell warned. Banff and Buchan MP David Duguid, who sits on the committee, said there were Brexiteers in the fish processing industry too and asked the panel of experts if there was a precedent for a free trade deal based on continued access to the waters of an independent coastal state, which the UK will eventually be after Brexit. “I have heard those concerns before,” he said. 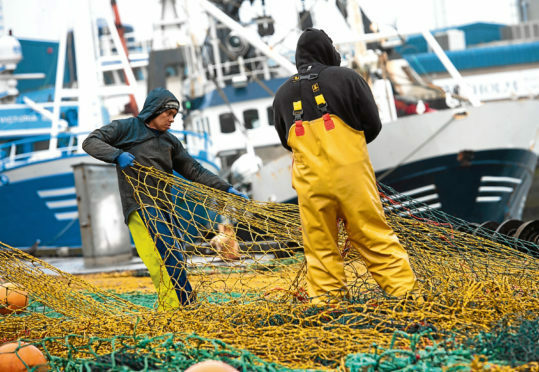 “But I have also heard fish processors who express a desire for as free a trade agreement as they can possibly have and who also wish not to be to the detriment of the Scottish fishing fleet. Edinburgh University’s Professor of European Union, Andrew Scott, said there was “a general obligation” to share waters. He said: “There is a general obligation for countries who have fishing waters adjacant to coordinate fishing policy. “It’s a general obligation, not a specific, detailed outcome. So Norway, for example, discusses fishing policy with the EU.